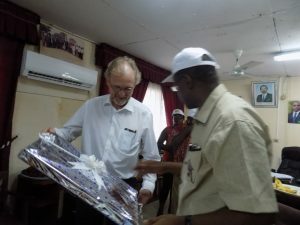 The partnership between the Cameroon Development Corporation and the European Union (E.U) came under scrutiny on Saturday December 2, 2017 in Tiko. Banana is a cash crop grown by the CDC and exported to the European Union. Since 2013, the CDC receives huge grants from the E.U within the framework of Banana Accompanying Measures (BAM). The aim is to assist the CDC in its drive to sustainably produce good quality banana in sufficient quantity. 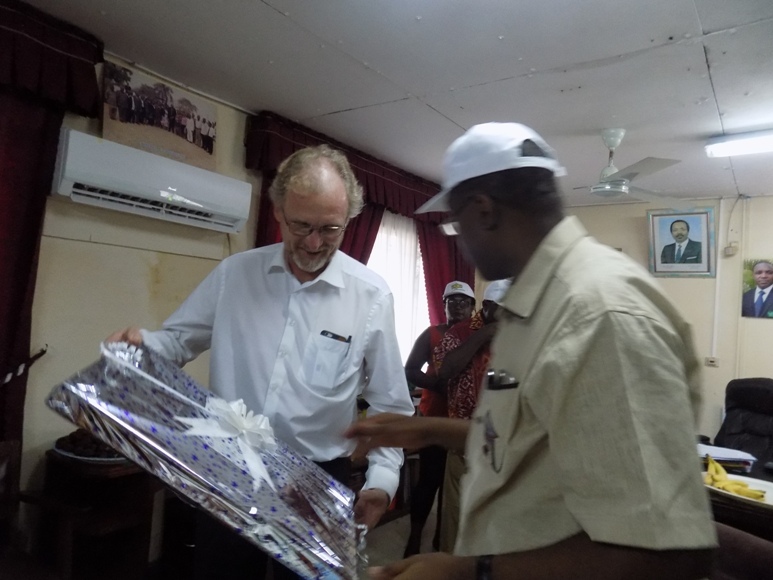 It is against this backdrop that the European Union Ambassador to Cameroon, H.E Hans Peter Schadek visited the CDC. 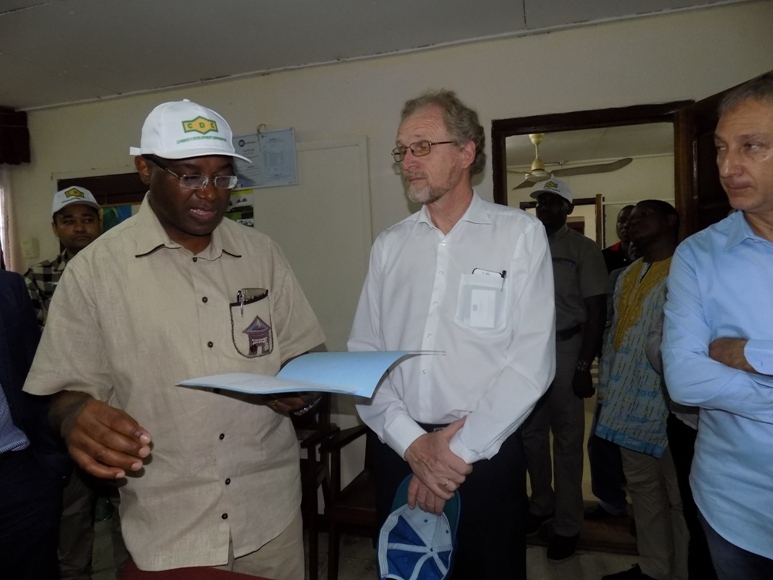 Received by the Corporation’s General Manager, Mr. Franklin Ngoni Njie at the Group Banana Office in Likomba-Tiko, the ambassador was given an overview of the CDC’s activities. The discussion was further narrowed to the Banana sector and the support it receives from the European Union. The GM explained that “the year 2017 has not been a good one for Cameroon’s banana sector in general and the CDC in particular. Too much rain and floods affected fruit formation and increased disease incidence. As a result, we lost over 20.000 pallets of banana.” To correct this, the General Manager said “we will have to be more innovative in the coming years and capitalize our ongoing partnership with sister companies in the banana sector”. The Ambassador and his delegation visited the Benoe Banana Estate where the production and distribution chains were properly explained. Thereafter, they set out for the Mungo Pumping Station where the European Union sponsored the acquisition of two high capacity electric generators of 910 KVA each. There, the ambassador ascertained the role of energy supply in irrigation. He praised the CDC for her efforts in ensuring the availability of the banana fruit and urged the Corporation “to keep up the good work”. It should be noted that, the CDC benefits from two out of the three projects under Banana Accompanying Measures. They include: Productive Projects for which the EU provides 80 % of funds and the remaining 20 % provided by the CDC as well as Environmental and Social Projects which are entirely funded by the European Union. Within the past four years, the European Union has assisted the C.D.C in the construction of clinics, canteens, purchase of light/ heavy vehicles, electric generators amongst others. Also present during the visit was the President of the Parliamentary Assembly of the African, Caribbean and Pacific, ACP countries and Co-President of the joint ACP/European Union Parliamentary Assembly, Hon Owona Kono Joseph Hyacinthe.